This article on job shop manufacturing leadership was originally published in 2012 , but was updated to reflect the current data and my current thinking. This has been one of my most popular and controversial posts ever. Some (not all) of the feedback I’ve received is below. Please add yours. As you probably know, I work in job shop manufacturing. I’ve owned a job shop and now I help custom job shops and machine shops to reduce lead-time, improve due date performance, and reduce chaos with our nationally recognized 14 week coaching program – Velocity Scheduling System. And, to do that, some leadership is involved, so I did a little internet surfing on leadership, a subject I rarely give any thought to. In a Google search there were 455,000,000 results for the word leadership. On the National Speakers Association’s website there are over 920 speakers (up from 650) who are experts on Leadership. I don’t know about you, but as an engineer and NOT a very touchy feely kind of person, I have trouble relating to all the discussion on leadership. I don’t have anything against leadership or the people who speak on it or write about it (there are tons of those people and some of them are my friends), I just don’t see what the big deal is. It just doesn’t seem that complicated to me. I’m an expert in Theory of Constraints. Theory of Constraints is about focus, so assuming you are focused. There are only 2 things – guiding principles if you will — that a leader or manager needs to keep in mind. 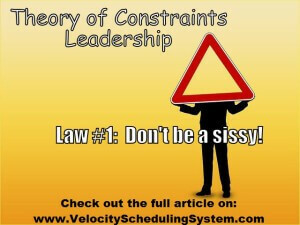 I call them the Theory of Constraints 2 Laws of Leadership. I don’t think there are 10 qualities of a leaders or 5 key elements of leadership. I think there are just 2 laws. FYI, these are not Dr. Eli Goldratt approved. I developed my thoughts on leadership after he passed. However, I’ve used what I learned from him and working with him to formulate these two laws. LAW 1) Don’t be a sissy! LAW 2) Just do it! Now that sounds easy, probably too easy. So let’s apply it. Don’t be a sissy means – don’t let old patterns, past ways of doing things, and failures stop you from finally getting 99+% on time all the time, reducing lead-time, and from dramatically reducing chaos or whatever your goals are. Pick a technique, a philosophy, or anything that you think might get you closer to your goals. And realize that if you want improvement, you have to DO SOMETHING different. It is also true that not all change is improvement, so select carefully, but DO make a selection. I once told a client who wanted to do an incentive program (which generally I’m against) that I didn’t care if they wanted to bring clowns in on Fridays – but to DO SOMETHING. Now, I’m partial to my programs and Theory of Constraints for the “something to do” – but even if you don’t go with the changes I recommend, you will get some improvement simply by doing something and sticking with it. 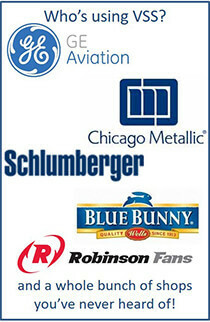 For example GE chose Six Sigma as the horse they would ride. I can tell you why that may not be the best overriding philosophy, and how they could get better results by using Theory of Constraints to direct their Six Sigma efforts (see 2 articles below), but the reality is that they did improve by making the selection and sticking to it. Don’t be a sissy also means don’t make excuses and don’t blame anyone but yourself for the results you get or don’t get. and processes comprise the policies, procedures and measures that direct our peoples’ actions. If you’re not getting the results you want, just look in the mirror. And one other thing that “don’t be a sissy” means is that if you make a mistake, chose wrong, or fail – then get over it and find what IS going to work. This is NOT in conflict with my prior statement of “sticking with it”. I find that people either 1) don’t try something long enough to see if it’s going to work – they get distracted by the next new shiny thing; or 2) they stick with it forever despite the poor results. I’m suggesting a rational balance between the two. And a good way to do that is to decide ahead of time what success and failure look like, then do everything to can to make whatever you decided to do a success. If you want better results you are going to have to do things differently. Simply decide WHAT you’re going to do and just do it — like the bunny in the video. P.P.S Check out the webinar if you have a custom job shop and need to reduce time through your shop, get on-time and reduce chaos. This is a coaching program to help implement what you read in the Theory of Constraints book The Goal by Eliyahu M Goldratt. WARNING: This is NOT training, this is a go and do program. Sissies need not apply! This article is copyrighted by Science of Business, Inc. I like this article and have actually got a doubt, not on leadership but you said “look in the mirror” and this is related to that. In many TOC implementations we are doing we dont change measurement initially stating that let’s get some results firstand then get total buy in(as first buy in to is to try the new system) and change the measurements then. My doubt is whether this is the right way? or should we insist on changing measurement also if we got buy in to try the new system. If measurements are preventing the new system then change them right away. If they are not, then I would not do this first. it is my experience that it is much easier to change measurements once we’ve gotten results. But if the measurement are preventing the results then obviously they need to be changed. I owned a small coffee house for many years. I applied this theory every day, wish I had known it had a name or some outline to it 🙂 I gave a lecture at a local university near the shop on entrepreneurship. My number one message stemmed from my time working in a rescue team. We were always told if you get lost in the woods to “hug a tree” and someone will come find you. That is great in most circumstances but one of the things you give up by being a leader is the guarantee that someone will come looking for you. In business, especially as the owner and especially in small business if you hug a tree they will find a well preserved skeleton and learn from your mistakes. Its always better to pick a direction (any direction) and move in a straight line until something starts to look familiar or make sense. One foot in front of the other and believe in yourself. Be responsible for your own rescue and be ready to walk the path alone for a while. If you aren’t willing to take the risk no one else will do it for you and they certainly wont sit around the tree and starve with you. Thanks for putting this out here far more eloquently than I could have! The article is hugely important. Constant improvement demands change! Even when the path forward is unclear making a change is vital. Even if it is not “THE” answer it eliminates one possibility but also may illuminate a better way. If we do nothing then we can only work within and provide the best results our current systems will allow. Many who aspire to Management will only struggle with management. Note the 2 are case sensitive. Grapple with touchy feely and realize that unbridled success depends on accepting the things that matter and those end up being personal, inspirational and respectful. This can go a long way in making the sheep follow and you can keep the rabbit and the border collie as pets. Or one can just keep chasing targets that don’t follow you where you believe they just need to be demanded to go. On leadership, may I add this. I have practiced meditation and writing a journal for two decades. Meditation has given me a) more courage to persevere with projects; b) a greater capacity to envision. Writing a journal has taught me to be much more attentive in conversations and much more attentive to my moods and my inner world. The problem you covered here has much to do with procrastination out of fear, and dogmatism born of fear and lack of vision. Dr. Warren Bennis stated that first of all, the leader is one who has a vision of the future state of something, be it a project, an organization, a building, a play, whatever. Dr. Mary Carruthers stated in a book on Medieval mnemonics, ”Monasteries are factories of vision.” Meditation relaxes our neural pathways, so that certain ones don’t dominate us, such as circuits spiralling us into depression, rage or whatever negative emotion = even dogma. For this reason, I believe that meditation over years releases us from much dogma (see the book, On Dialogue, by Nobel Prize winner, Dr. David Bohm, who speaks much of kinesthetic perception – proprioception, and dialogue and dogma and such). Meditation opens us to synthesize information better, allowing us to envision. It is a non-invasive form of hallucinogenic mushrooms: recently, neurological researchers have found that these open neural pathways throughout the brain, so researchers have postulated a role for such hallucinogenics for treating mental illness such as schizophrenia or manic depressiveness, which may have atrophied neural pathways. I think journaling can help in this respect as well. Dr. Norman Dixon, the psychologist who wrote the book, On the Psychology of Military Incompetence, stated that the competent generals were introspective and had no qualms about taking on introspective or touchy-feely interests, such as art or poetry. In short, they had depth and humanity, they had creativity, which allowed them to deal with people exceptionally well, build great teams and, as they had an inner, creative side, to project great strategies. The point is that the ”root cause” of procrastination and dogma is fear and lack of vision. The point is that certain activities tend to help people to overcome them. Touchy-feely activities? Touching has much to do with objects in space and proprioception. Feeling has to do with e-motions: a mental function telling us how we should orient ourselves in space, in society, with others. It tells us how to connect with reality. Emotion and touching are, in a way, networking and topological faculties. I will finally share a very personal story, Dr. LIsa. I was failing differential equations and object-oriented programing. My dream was a doctorate in cybernetics, to be able to do computer simulations of organizations to use D’Arcy Thompson’s ideas about biological morphology to design organizations far better than bureaucracy. I went through loads of cognitive tests. One verdict: I was very weak in synthesis of information. I was far too analytical. The cognitive psychologist who studied my results said to me – now I hope this will make you laugh rather than making you angry, ”You’ve got to think much more like a woman.” Indeed, there is, I think, a profound link between space, emotions and such things as mathematics. So have no fear of the touchy-feely. Finally, I believe that leadership has a profoundly spiritual side. Bennis saw leaders as creators – such as engineers are, synthesizing ideas on how to create solutions to problems in matter, space and time. They are sculptors of these elements, painters of these elements. When Charlie Rose, the great interviewer, asked Werner Herzog why he spent five years sweating in the Venezuelan jungle to make the film, Fitzcaraldo, Herzog replied ”The vision was so strong within me, that I just had to do it.” That is leadership. I tease Haitian friends, but there is much truth in this teasing: in Voudou, the priest or priestess invokes a god or goddess to come to the ceremony to help the community solve a problem. One of the dancers will be possessed of that god or spirit. The god or spirit speaks through them. And so, with leadership and Werner Herzog: to be leaders, we must develop vision. Meditation and monasteries, journals and art work, yoga and dance: all help to foster this faculty. Strong vision gives us the courage – the emotion, to move forward, and the wisdom to know when to break molds of dogma. Just ask the great artist who was the archetype of great engineering: Leonardo da Vinci. I have been involved with Job Shops for about 50 years as a manager & as a consultant when there were only manual systems through to computerised scheduling & visual graphics systems. The reality is that managing job shops is a tough business & you must try many things to get a result. It means that a manager has to be pro-active or just do it! I can’t believe your paper was controversial!